Stewardship is a grateful response to God's love. Based in Scripture, all that we are and all that we have flows from God as gift. In turn, we serve as stewards of our spiritual and material gifts and we share these gifts in love of God and neighbor. The four pillars of Stewardship are: Hospitality, Prayer, Formation, and Service. 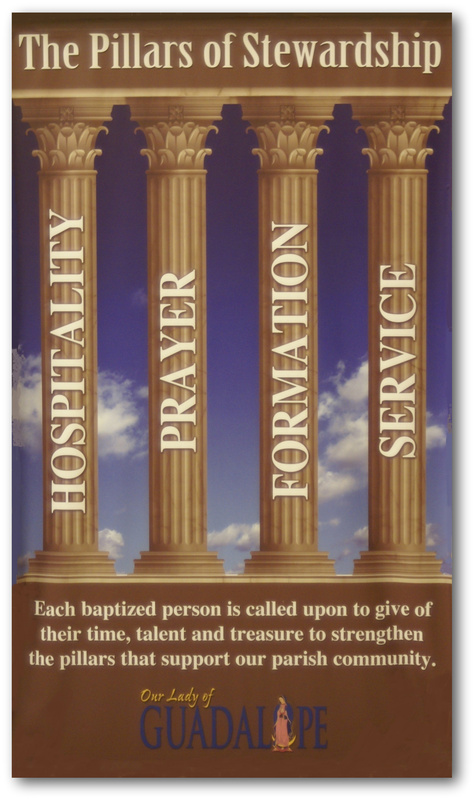 Every year, as we reflect on our life in Christ Jesus, it is wise to examine these four pillars and recommit ourselves to a more serious attempt at following our Savior’s lead in hospitality, prayer, formation and service. As pastor, I’d like to take this opportunity to thank you for your continued generosity to Our Lady of Guadalupe Church. As we do each year, our parish examines its mission and creates its budget based on the stewardship intention forms we receive from each of you. The effective fulfillment of the mission of our parish is dependent upon your participation in time, talent and treasure. Please give some consideration to the many opportunities in our various ministries available for service to the parish and wider community. You may review the stewardship booklet here, print out a commitment form or, new this year, submit your commitment online.